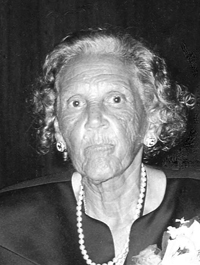 Augustus Funeral Home regrets to announce the passing of Mary Marechaux Elizabeth Trott. A Home Going service for Mary Marechaux Elizabeth Trott, daughter of the late Victor and Amelia Trott, loving mother to Rita Smith, Ellen Baker [Melvin Sr.], Kenneth [Marie] and the late Daniel Trott [Deborah], sister to Constance Gray, Janet Outerbridge, Marion Edmead, Lydia Foggo, Nellie Deshields, Helen Wade, the late Neville, Varnel, George, Jacob, Herbert, Victor V. Jr., in her 97th year of Sylvia Richardson Nursing Home, formally of 6 Wellington Hill, St. George will be held at Ebenezer Methodist Church, St. George Today Monday, August 27, 2018 at 3:00 pm. Interment will follow the service at Methodist Cemetery, St. George. Relatives and friends may pay their last respects at Ebenezer Methodist Church, St. George today Monday, August 27, 2018 from 2:00 pm – 2:50 pm. Lovingly remembered by grandsons: Maurice Trott [Wendy] John “Roy” Trott [Kim], Lawrence Smith [Sabrina], Damion McIntosh [Leah], Jamel McIntosh, Mikko Trott, Danyon Trott [Deneka], Melvin, Makai and Marcal Baker, Lawrence Smith, Jr., Laroy Trott, Jordan Trott, Prince-Lawrence Smith, Lerone Simons [Christyn]; granddaughters: Larita Smith, Charmaine Trott, Jada and Mya Trott; great grandchildren: Tiyonna and Aldonte’ Smith, Dejion McIntosh Chari and Chae-ore Trott, Nakiah, Xyiahn, Quadae’ and Messiah Baker, Jayden Simons; great-great grandchildren: Xaelahn, Callie and Caiius Smith; many other relatives and friends too many to mention. For this celebration of the life of Mae, colours may be worn.